This listing is for my NaturOwl Owlchy Ointment in a 1oz glass jar. 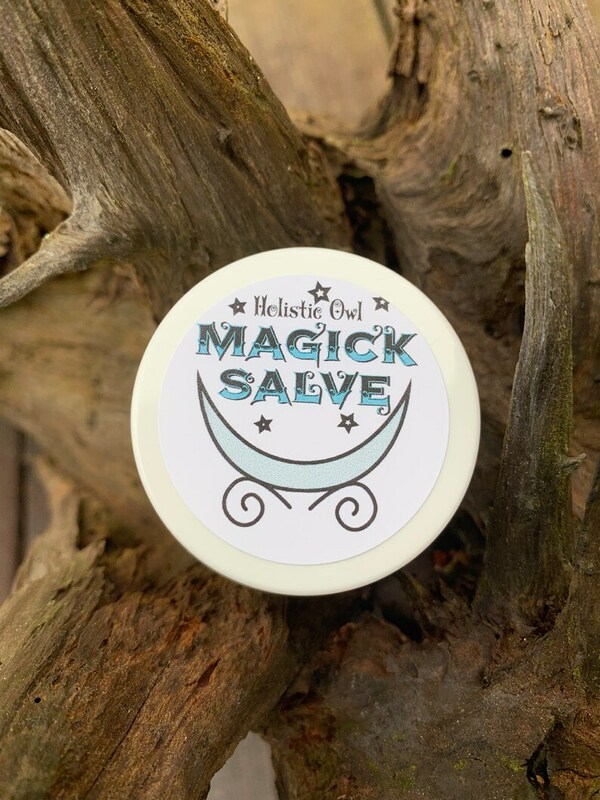 I now call it Magick Salve because every time someone in the house uses it they say it works like magic. When I felt pain from a cat scratch, burn, mosquito bite, bruise or any time of injury this stuff always comes to the rescue. I will include a lip balm size container of it for your bag. I have 3 small children in the house and between the falls, bumps, burns, insect bites, sunburn, and bruises. I wanted to make a salve at home that had natural and safe ingredients in them. I also lift weights and this really soothes those achy muscles the next day. This really soothes burns as my husband tested it out when he grabbed a stainless steel pan from the oven...OUCH. Arnica Flower Oil - treatment for physical trauma, sprains, bruising, and other injuries. Helps reduce swelling and is very soothing to the skin. Organic Grapeseed Oil - especially useful for skin types that do not absorb oils well, and it does not leave a greasy feeling. Organic Tea Tree essential oil - antibacterial, antifungal, anti-inflammatory, antimicrobial, antiparasitic, antiseptic, antiviral, and analgesic. Great healing properties for the skin. Benefits blisters, burns, insect bites, sunburn, skin rashes, etc. I love this tooth powder! It did take me about three days to get used to it but now I love it and the glass container it comes in is so portable, neat, and sweet! The powder itself goes through several flavors in your mouth and it doesn't get messy if it spills (unlike toothpaste).Will be a returning customer when my two glass containers run out! Thank you for communication and I will do future business. Really good product, my husband loved it!